Significant progress has been made in recent years on the development of gravitational wave detectors. Sources such as coalescing compact binary systems, low-mass X-ray binaries, stellar collapses and pulsars are all possible candidates for detection. The most promising design of gravitational wave detector uses test masses a long distance apart and freely suspended as pendulums on Earth or in drag-free craft in space. The main theme of this review is a discussion of the mechanical and optical principles used in the various long baseline systems being built around the world — LIGO (USA), VIRGO (Italy/France), TAMA 300 (Japan) and GEO 600 (Germany/UK) — and in LISA, a proposed space-borne interferometer. A revised version of this article is available at 10.12942/lrr-2011-5. Gravitational waves, one of the more exotic predictions of Einstein’s General Theory of Relativity may, after decades of controversy over their existence, be detected within the next ten years. Sources such as interacting black holes, coalescing compact binary systems, stellar collapses and pulsars are all possible candidates for detection; observing signals from them will significantly boost our understanding of the Universe. New unexpected sources will almost certainly be found and time will tell what new information such discoveries will bring. Gravitational waves are ripples in the curvature of space-time and manifest themselves as fluctuating tidal forces on masses in the path of the wave. The first gravitational wave detectors were based on the effect of these forces on the fundamental resonant mode of aluminium bars at room temperature. Initial instruments were constructed by Joseph Weber [104, 105] and subsequently developed by others. Reviews of this early work are given in [101, 23]. Following the lack of confirmed detection of signals, aluminium bar systems operated at and below the temperature of liquid helium were developed and work in this area is still underway [73, 76, 2, 42]. However the most promising design of gravitational wave detectors, offering the possibility of very high sensitivities over a wide range of frequency, uses widely separated test masses freely suspended as pendulums on earth or in a drag free craft in space; laser interferometry provides a means of sensing the motion of the masses produced as they interact with a gravitational wave. Ground based detectors of this type, based on the pioneering work of Bob Forward and colleagues (Hughes Aircraft) , Rai Weiss and colleagues (MIT) , Ron Drever and colleagues (Glasgow/Caltech)[25, 24] and Heinz Billing and colleagues (MPQ Garching) , will be used to observe sources whose radiation is emitted at frequencies above a few Hz, and space borne detectors, as originally envisaged by Peter Bender and Jim Faller [21, 30] at JILA will be developed for implementation at lower frequencies. Already gravitational wave detectors of long baseline are being built in a number of places around the world; in the USA (LIGO project led by a Caltech/MIT consortium) [4, 14], in Italy (VIRGO project, a joint Italian/French venture) [13, 50], in Germany (GEO 600 project being built by a collaboration centred on the University of Glasgow, the University of Hannover, the Max Planck Institute for Quantum Optics, the Max Planck Institute for Gravitational Physics (Albert Einstein Institute), Golm and the University of Wales, Cardiff) [47, 102] and in Japan (TAMA 300 project) [99, 70]. A space-borne detector, LISA, [20, 52, 28] — proposed by a collaboration of European and US research groups — has been adopted by ESA as a future Cornerstone Mission. When completed, this detector array should have the capability of detecting gravitational wave signals from violent astrophysical events in the Universe, providing unique information on testing aspects of General Relativity and opening up a new field of astronomy. We recommend a number of excellent books for reference. For a popular account of the development of the gravitational wave field the reader should consult Chapter 10 of ‘Black Holes and Time Warps’ by Kip S. Thorne . 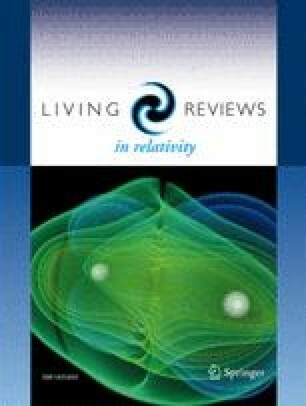 A comprehensive review of developments toward laser interferometer detectors is found in ‘Fundamentals of Interferometric Gravitational Wave Detectors’ by Peter Saulson , and discussions relevant to the technology of both bar and interferometric detectors are found in ‘The Detection of Gravitational Waves’ edited by David Blair . In addition to the home site of this journal and the sites listed above there is a very informative general site maintained by the National Centre for Supercomputing Applications . Some early relativists were sceptical about the existence of gravitational waves; however, the 1993 Nobel Prize in Physics was awarded to Hulse and Taylor for their experimental observations and subsequent interpretations of the evolution of the orbit of the binary pulsar PSR 1913+16 [49, 96], the decay of the binary orbit being consistent with angular momentum and energy being carried away from this system by gravitational waves . Gravitational waves are produced when matter is accelerated in an asymmetrical way; but due to the nature of the gravitational interaction, detectable levels of radiation are produced only when very large masses are accelerated in very strong gravitational fields. Such a situation cannot be found on earth but is found in a variety of astrophysical systems. Gravitational wave signals are expected over a wide range of frequencies; from ≃ 10-17 Hz in the case of ripples in the cosmological background to ≃ 103 Hz from the formation of neutron stars in supernova explosions. The most predictable sources are binary star systems. However there are many sources of much greater astrophysical interest associated with black hole interactions and coalescences, neutron star coalescences, low-mass X-ray binaries such as Sco-X1, stellar collapses to neutron stars and black holes (supernova explosions), pulsars, and the physics of the early Universe. For a full discussion of sources refer to the material contained in references [51, 18, 66]. Why is there currently such interest worldwide in the detection of gravitational waves? Partly because observation of the velocity and polarisation states of the signals will allow a direct experimental check of the wave predictions of General Relativity; but more importantly because the detection of the signals should provide observers with new and unique information about astrophysical processes. It is interesting to note that the gravitational wave signal from a coalescing compact binary star system has a relatively simple form and the distance to the source can be obtained from a combination of its signal strength and its evolution in time. If the redshift at that distance is found, Hubble’s Constant — the value for which has been a source of lively debate for many years — may then be determined with, potentially, a high degree of accuracy . Only now technology has reached a stage where the building of detectors of the sensitivity required to observe such interesting sources can be envisaged. where ΔL is the change in separation of two masses a distance L apart; for the strongest allowed component of gravitational radiation the value of h is proportional to the third time derivative of the quadrupole moment of the source of the radiation and inversely proportional to the distance to the source. The radiation field itself is quadrupole in nature and this shows up in the pattern of the interaction of the waves with matter. The problem for the experimental physicist is that the predicted magnitudes of the amplitudes or strains in space in the vicinity of the earth caused by gravitational waves even from the most violent astrophysical events are extremely small, of the order of 10-21 or lower . Indeed current theoretical models on the event rate and strength of such events suggest that in order to detect a few events per year — from coalescing neutron star binary systems for example — an amplitude sensitivity close to 10-22 over timescales as short as a millisecond is required. If the Fourier transform of a likely signal is considered it is found that the energy of the signal is distributed over a frequency range or bandwidth which is approximately equal to 1/timescale. For timescales of a millisecond the bandwidth is approximately 1000 Hz, and in this case the spectral density of the amplitude sensitivity is obtained by dividing 10-22 by the square root of 1000. Thus detector noise levels must have an amplitude spectral density lower than ≃ 10-23(Hz)-1/2 over the frequency range of the signal. Signal strengths at the earth, integrated over appropriate time intervals, for a number of sources are shown in Fig. 1. Some possible sources for ground based and space-borne detectors. The weakness of the signal means that limiting noise sources like the thermal motion of molecules in the detector (thermal noise), seismic or other mechanical disturbances, and noise associated with the detector readout, whether electronic or optical, must be reduced to a very low level. For signals above ≃ 10 Hz ground based experiments are possible, but for lower frequencies where local fluctuating gravitational gradients and seismic noise on earth become a problem, it is best to consider developing detectors for operation in space . The earliest experiments in the field were ground based and were carried out by Joseph Weber of the University of Maryland about 30 years ago. With colleagues he began by looking for evidence of excitation of the normal modes of the earth by very low frequency gravitational waves . Weber then moved on to look for tidal strains in aluminium bars which were at room temperature and were well isolated from ground vibrations and acoustic noise in the laboratory [104, 105]. The bars were resonant at ≃ 1600 Hz, a frequency where the energy spectrum of the signals from collapsing stars was predicted to peak. Despite the fact that Weber observed coincident excitations of his detectors placed up to 1000 km apart, at a rate of approximately one event per day, his results were not substantiated by similar experiments carried out in several other laboratories in the USA, Germany, Britain and Russia. It seems unlikely that Weber was observing gravitational wave signals because, although his detectors were very sensitive, being able to detect strains of the order of 10-15 over millisecond timescales, their sensitivity was far away from what was predicted to be required theoretically. Development of Weber bar type detectors has continued with the emphasis on cooling to reduce the noise levels; currently systems at the Universities of Rome , Padua , Louisiana  and Perth (Western Australia)  are achieving sensitivity levels better than 10-18 for millisecond pulses. At present (beginning of 2000) these are the most sensitive detectors of gravitational waves which are in operation. Bar detectors have a disadvantage, however, in that they are sensitive only to signals that have significant spectral energy in a narrow band around their resonant frequency. An alternative design of gravitational wave detector based on a laser interferometer, overcomes this limitation and is introduced in the following section. An alternative design of gravitational wave detector offers the possibility of very high sensitivities over a wide range of frequency. It uses test masses which are widely separated and freely suspended as pendulums to isolate against seismic noise and reduce the effects of thermal noise; laser interferometry provides a means of sensing the motion of these masses produced as they interact with a gravitational wave (Fig. 2). Schematic of gravitational wave detector using laser interferometry. This technique is based on the Michelson interferometer and is particularly suited to the detection of gravitational waves as they have a quadrupole nature. Waves propagating perpendicular to the plane of the interferometer will result in one arm of the interferometer being increased in length while the other arm is decreased and vice versa. The induced change in the length of the interferometer arms results in a small change in the intensity of the light observed at the interferometer output. As will be explained in detail in the next chapter, the sensitivity of an interferometric gravitational wave detector is limited by noise from various sources. 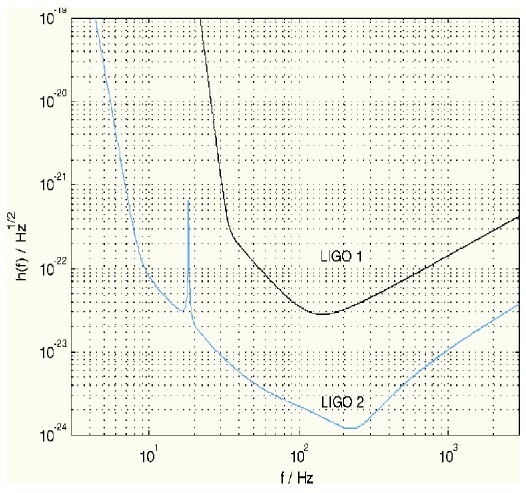 Taking this frequency dependent noise floor into account, the American LIGO 1 detector will have a sensitivity (shown in Fig. 3), which would allow a reasonable probability for detecting gravitational wave sources. In order to observe a full range of sources and to initiate gravitational wave astronomy, a sensitivity or noise performance approximately ten times better in the mid-frequency range and several orders of magnitude better at 10 Hz, is desired. Such a performance is planned for a future LIGO upgrade, LIGO 2. 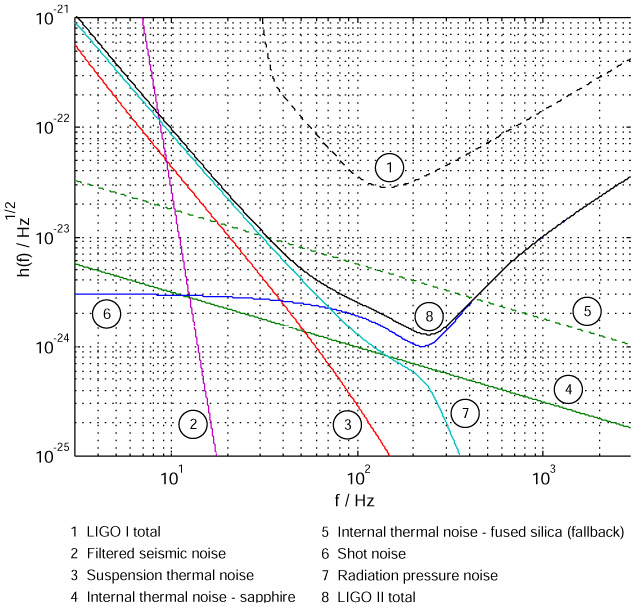 Proposed sensitivity for the LIGO 1 and planned LIGO 2 detectors. For the initial interferometric detectors we require a noise floor in strain close to 2 × 10-23(Hz)-1/2 to be achieved. For an earth based detector the distance between the test masses is limited to a few km by geographical and cost factors. If we assume an arm length of 3 to 4 km, detecting a strain in space of the above level implies measuring a residual motion of each of the test masses of about 3 × 10-20 m(Hz)-1/2 over part of the operating range of the detector, which may be from ≃ 10 Hz to a few kHz. This sets an formidable goal for the optical detection system at the output of the interferometer. In this chapter we discuss the main noise sources which limit the sensitivity of interferometric gravitational wave detectors. Fundamentally it should be possible to build systems using laser interferometry to monitor strains in space which are limited only by the Heisenberg Uncertainty Principle; however there are other practical issues which must be taken into account. Fluctuating gravitational gradients pose one limitation to the interferometer sensitivity achievable at low frequencies, and it is the level of noise from this source which dictates that experiments to look for sub-Hz gravitational wave signals have to be carried out in space [93, 85, 5, 48]. In general, for ground based detectors the most important limitations to sensitivity result from the effects of seismic and other ground-borne mechanical noise, thermal noise associated with the test masses and their suspensions and shot noise in the photocurrent from the photodiode which detects the interference pattern. The significance of each of these sources will be briefly reviewed. Seismic noise at a reasonably quiet site on the earth follows a spectrum in all three dimensions close to 10-7 f-2 m(Hz)-1/2 (where here and elsewhere we measure f in Hz) and thus if the disturbance to each test mass must be less than 3 × 10-20 m(Hz)-1/2 at, for example, 30 Hz then the reduction of seismic noise required at that frequency in the horizontal direction is greater than 109. Since there is liable to be some coupling of vertical noise through to the horizontal axis, along which the gravitational wave induced strains are to be sensed, a significant level of isolation has to be provided in the vertical direction also. Isolation can be provided in a relatively simple way by making use of the fact that, for a simple pendulum system, the transfer function to the pendulum mass of the horizontal motion of the suspension point falls off as 1/(frequency)2 above the pendulum resonance. In a similar way isolation can be achieved in the vertical direction by suspending a mass on a spring. In the case of the VIRGO detector system the design allows operation to below 10 Hz and here a seven stage horizontal pendulum arrangement is adopted with six of the upper stages being suspended with cantilever springs to provide vertical isolation . Similar systems are being developed in Australia  and at Caltech . For the GEO 600 detector, where operation down to 50 Hz is sought, a triple pendulum system is used with the first two stages being hung from cantilever springs to provide the vertical isolation necessary to achieve the desired performance. This arrangement is then hung from a plate mounted on passive ‘rubber’ isolation mounts and on an active (electro-mechanical) anti-vibration system ,  as shown in Fig. 4. Schematic view of one suspension system for use in the GEO 600 interferometer. In order to cut down motions at the pendulum frequencies, active damping of the pendulum modes has to be incorporated, and to reduce excess motions at low frequencies around the micro-seismic peak, low frequency isolators have to be incorporated. These low frequency isolators can take different forms -tall inverted pendulums in the horizontal direction and cantilever springs whose stiffness is reduced by means of attractive forces between magnets for the vertical direction in the case of the VIRGO system , Scott-Russell mechanical linkages in the horizontal and torsion bar arrangements in the vertical for an Australian design , and a seismometer/actuator system for GEO 600 . In this formula m is the mass of the test mass, ω is an angular frequency in the operating range of the detector, ω0 is the resonant angular frequency of the fundamental mode, ϕmat(ω) is the intrinsic material loss, and β is a correction factor to include the effect of summation of the motion over the higher order modes of the test mass (taking into account the effect of a finite optical beam size and correction for the effective masses of the modes). Typically, as calculated by Gillespie and Raab , β is a number less than 10. A different and more general treatment of internal thermal noise using evaluation of the relevant mechanical impedance has been carried out by Bondu et al. . This was based on work of Yuri Levin  and gives good agreement with the results of Gillespie and Raab. In order to keep thermal noise as low as possible the mechanical loss factors of the masses and pendulum resonances should be as low as possible. Further the test masses must have a shape such that the frequencies of the internal resonances are kept as high as possible, must be large enough to accommodate the laser beam spot without excess diffraction losses, and must be massive enough to keep the fluctuations due to radiation pressure at an acceptable level. Test masses range in mass from 6 kg for GEO 600 to 30 kg for the first proposed upgrade to LIGO. To approach the best levels of sensitivity discussed earlier the loss factors of the test masses must be ≃ 3 × 10-8 or lower, and the loss factor of the pendulum resonances should be smaller than 10-10. Discussions relevant to this are given in [81, 79]. Obtaining these values puts significant constraints on the choice of material for the test masses and their suspending fibres. One viable solution which should allow detector sensitivities to approach the level desired for upgraded detectors is to use fused silica masses hung by fused silica fibres [12, 83], as the intrinsic loss factors in samples of synthetic fused silica have been measured at around 3 × 10-8 [62, 94]. Still, the use of other materials such as sapphire is being seriously considered for future detectors as mentioned in section 6 [11, 54, 81]. The technique of hydroxy-catalysis bonding provides a method of jointing oxide materials in a suitably low loss way to allow ‘monolithic’ suspension systems to be constructed . 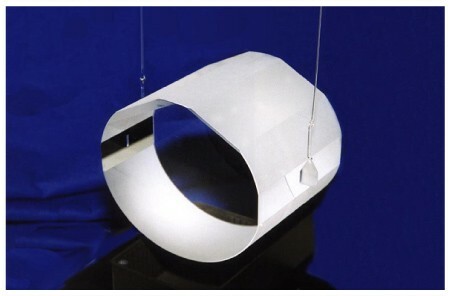 A picture of such a prototype fused silica mass suspended by two fused silica fibres, which has been constructed in Glasgow and is being tested at the University of Perugia, is shown in Fig. 5. Prototype ‘monolithic’ fused silica test mass suspension. The mass (3 kg) here is of 12.5 cm diameter. Note final suspension will use four fibres. For gravitational wave signals to be detected, the output of the interferometer must be held at one of a number of possible points on an interference fringe. An obvious point to choose is halfway up a fringe since the change in photon number produced by a given differential change in arm length is greatest at this point. The interferometer may be stabilised to this point by sensing any changes in intensity at the interferometer output with a photodiode and feeding the resulting signal back, with suitable phase, to a transducer capable of changing the position of one of the interferometer mirrors. Information about changes in the length of the interferometer arms can then be obtained by monitoring the signal fed back to the transducer. where c is the velocity of light and h is Planck’s constant and we assume that the photodetectors have a quantum efficiency ≃ 1. Thus achievement of the required strain sensitivity level requires a laser, operating at a wavelength of 10-6 m, to provide 6×106 W power at the input to a simple Michelson interferometer. This is a formidable requirement; however there are a number of techniques which allow a large reduction in this power requirement and these will be discussed in the next section. As explained in the preceeding section, 4.3, high power laser light is needed to overcome limitations of a detector’s sensitivity due to photoelectron shot noise. The situation can be helped greatly if a multi-pass arrangement is used in the arms of the interferometer as this multiplies up the apparent movement by the number of bounces the light makes in the arms. The multiple beams can either be separate as in an optical delay line [107, 6], or may lie on top of each other as in a Fabry-Perot resonant cavity  as shown in Fig. 6. 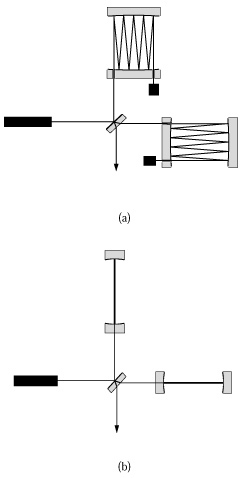 Michelson interferometers with (a) delay lines and (b) Fabry-Perot cavities in the arms of the interferometer. Optimally, the light should be stored for a time comparable to the characteristic timescale of the signal. Thus if signals of characteristic timescale 1 msec are to be searched for, the number of bounces should be approximately 50 for an arm length of 3 km. With 50 bounces the required laser power is reduced to 2.4 × 103 W, still a formidable requirement. It can be shown that optimum signal to noise ratio in a Michelson interferometer can be obtained when the arm lengths are such that the output light is very close to a minimum. (This is not intuitively obvious and is discussed more fully in ). Thus rather than lock the interferometer to the side of a fringe as discussed above in 4.3, it is usual to make use of a modulation technique to operate the interferometer close to a null in the interference pattern. An electro-optic phase modulator placed in front of the interferometer can be used to phase modulate the input laser light. If the arms of the interferometer are arranged to have a slight mismatch in length this results in a detected signal which when demodulated, is zero with the cavity exactly on a null fringe and changes sign on different sides of the null providing a bipolar error signal; this can be fed back to the transducer controlling the interferometer mirror to hold the interferometer locked near to a null fringe. 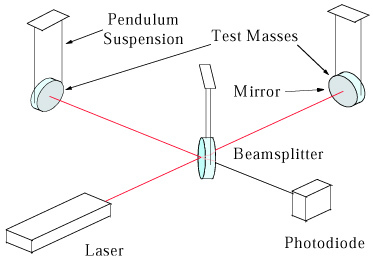 In this situation if the mirrors are of very low optical loss, nearly all of the light supplied to the interferometer is reflected back towards the laser. In other words the laser is not properly impedance matched to the interferometer. The impedance matching can be improved by placing another mirror of correctly chosen transmission — a power recycling mirror — between the laser and the interferometer so that a resonant cavity is formed between this mirror and the rest of the interferometer; in the case of perfect impedance matching no light is reflected back towards the laser [26, 88]. There is then a power build-up inside the interferometer. This can be high enough to create the required kilowatts of laser light at the beamsplitter, starting from an input laser light of only about 10 W.
To enhance further the sensitivity of an interferometric detector and to allow some narrowing of the detection bandwidth, which may be valuable in searches for continuous wave sources of gravitational radiation, another technique known as signal recycling can be implemented [65, 95, 41]. This relies on the fact that sidebands created on the light by gravitational wave signals interacting with the arms do not interfere destructively and so do appear at the output of the interferometer. If a mirror of suitably chosen reflectivity is put at the output of the system as shown in Fig. 7, then the sidebands can be recycled back into the interferometer where they resonate, and hence the signal size over a given bandwidth (set by the mirror reflectivity) is enhanced. 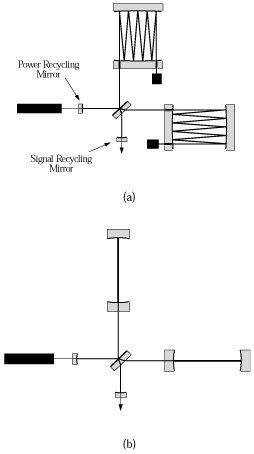 The implementation of power and signal recycling on the two interferometers shown in the previous figure, Fig. 6. The center of this frequency band is set by the precise length of the cavity formed by the signal recycling mirror and the cavities in the interferometer arms. Thus control of the precise position of the signal recycling mirror allows tuning of the frequency at which the performance is peaked. Often signal recycling will be used to provide a narrow bandwidth to search for continuous wave sources as mentioned above, however it may also be used with a relatively broad bandwidth, centered away from zero frequency, and this application is useful for matching the frequency response of the detector to expected spectral densities of certain broadband or “chirping” signals. Evaluating this at 10 Hz, for powers of around 5 × 103 W after the beamsplitter and masses of 30 kg, indicates an amplitude spectral density for each mass of 9 × 10-20 m(Hz)-1/2. Given the target sensitivity of the detector at 10 Hz in Fig. 3 of approximately 7 × 10-23(Hz)-1/2 which translates to a motion of each test mass of close to 10-19 m(Hz)-1/2 it is clear that radiation pressure may be a significant limitation at low frequency. Of course the effects of the radiation pressure fluctuations can be reduced by increasing the test masses, or by decreasing the laser power at the expense of deproving sensitivity at higher frequencies. It should be noted that as discussed in [27, 16, 17] and  for a simple Michelson system, the optimisation of laser power to minimise the combined effect photon shot noise and radiation pressure fluctuations allows one to reach exactly the sensitivity limit predicted by the Heisenberg Uncertainty Principle, in its position and momentum formulation. An extension of this analysis to a system with cavities in the arms has been carried out by one of the authors  with the same result and it seems likely to be true for the more complicated optical systems using power and signal recycling also. Using appropriate optical configurations that employ power and signal recyling as described above in 5.1 and 5.2, the required laser power may thus be reduced to a level (in the range of 10 to 100 W) where laser sources are or are becoming available; however stringent requirements on technical noise must be satisfied. To achieve this level of power fluctuations typically requires the use of active stabilisation techniques of the type developed for argon ion lasers . are required.This level of frequency noise may be achieved by the use of appropriate laser frequency stabilisation systems involving high finesse reference cavities . Although the calculation here is for a simple Michelson interferometer, similar arguments apply to the more sophisticated systems with arm cavities, power recycling and signal recycling discussed earlier and lead to the same conclusions. A typical beamsplitter misalignment of ≃ 10-7 radians means that to achieve sensitivities of the level described above using a detector with 3 or 4 km arms, and 50 bounces of the light in each arm, a level of beam geometry fluctuations at the beamsplitter of close to 10-12 m(Hz)-1/2 at 300 Hz is required. Typically, and ignoring possible ameliorating effects of the power recycling cavity on beam geometry fluctuations, this will mean that the beam positional fluctuations of the laser need to be suppressed by several orders of magnitude. The two main methods of reducing beam geometry fluctuations are 1) passing the input beam through a single mode optical fibre  and 2) using a resonant cavity as a modecleaner [84, 92, 109, 3]. Passing the beam through a single mode optical fibre helps to eliminate beam geometry fluctuations, as deviations of the beam from a Gaussian TEM00 mode are equivalent to higher order spatial modes, which are thus attenuated by the optical fibre. However there are limitations to the use of optical fibres mainly due to the limited power handling capacity of the fibres; care must also be taken to avoid introducing extra beam geometry fluctuations from movements of the fibre itself. A cavity may be used to reduce beam geometry fluctuations if it is adjusted to be resonant only for the TEM00 mode of the input light. Any higher order modes should thus be suppressed . The use of a resonant cavity should allow the handling of higher laser powers and has the additional benefits of acting as a filter for fast fluctuations in laser frequency and power [92, 109]. This latter property is extremely useful for the conditioning of the light from some laser sources as will be discussed below. From equation (5) it can be seen that the photon-noise limited sensitivity of an interferometer is proportional to P-1/2 where P is the laser power incident on the interferometer, and λ1/2 where λ is the wavelength of the laser light. Thus single frequency lasers of high output power and short wavelength are desirable. With these constraints in mind, laser development has concentrated on argon-ion lasers and Nd:YAG lasers. Argon-ion lasers emitting light at 514 nm have been used to illuminate several interferometric gravitational wave detector prototypes, see for example [91, 77]. They have an output power in the required single spatial (TEM00q) mode of operation typically of around several Watts, sufficient for this type of laser to have been proposed as the initial laser for a full-scale interferometric detector . For advanced detectors higher laser powers would be desirable and it has been demonstrated that the output of several argon-ion lasers could be coherently added for this purpose . However the disadvantages of argon-ion lasers include the increased optical absorption and damage, and more pronounced effects due to scattering, for light of this shorter wavelength. In addition argon-ion lasers are relatively inefficient. Nd:YAG lasers, emitting at 1064 nm or frequency doubled to 532 nm, present an alternative. The longer wavelength is less desirable than the 514 nm of the argon-laser, as more laser power is needed to obtain the same sensitivity; in addition, the resulting increase in beam diameter leads to a need for larger optical components. For example in an optical cavity the diameter of the beam at any point is proportional to the square root of the wavelength  and to keep diffractive losses at each test mass below 1 × 10-6 it can be shown that the diameter of each test mass must be greater than 2.6 times the beam diameter at the test mass. Thus the test masses for gravitational wave detectors have to be 1.4 times larger in diameter for infrared than for green light. Nd:YAG sources do however have some compelling advantages, and in particular the potential for scaling Nd:YAG laser designs up to levels of 100 W or more  combined with their superior efficiency, has led all the long baseline interferometer projects to choose some form of Nd:YAG light source. Compact sources of lower powers of Nd:YAG light have been available for several years in the form of monolithic diode-pumped ring lasers . Investigations have shown that the technical noise associated with these lasers may be well controlled and reduced to levels comparable to those needed for gravitational wave interferometer sources [55, 34, 15, 80, 39]. Different approaches to obtaining high powers of low-noise Nd:YAG light have been studied. They all have in common the use of a stable lower power laser as a master oscillator. One approach is to use a lower power Nd:YAG master oscillator to injection lock a higher power Nd:YAG slave laser, with the length of the slave laser cavity being locked to the frequency of the light from the master oscillator [19, 69, 37]. Up to 20 W of single frequency laser light have been obtained using this method , which has the desirable feature that the higher power slave laser light has noise properties which are for the most part dominated by those of the master laser light . This is desirable since it is typically easier to apply active noise reduction techniques to stabilise the lower power master lasers. Injection locked systems of this type are being developed for use by the VIRGO, TAMA 300 and GEO 600 projects, each of which requires ≃ 10 W of laser light for initial operation. However to adapt this technique for producing still higher powers from the slave laser requires care, since the light power needed from the master oscillator also increases. To meet this requirement systems have been proposed in which a series of lasers are successively injection locked. An alternative scheme has been developed for use by the LIGO project . Light from a master laser is passed through diode-pumped Nd:YAG amplification stages in a master oscillator/power amplifier (MOPA) configuration. This approach has the advantage of allowing a very high continous light power to be obtained using multiple amplification stages, without the need for multiple cavity locking schemes. However the effects of this design configuration on the noise properties of the amplified light must be addressed. In particular, to obtain high performance from the modulation techniques discussed in section 5.1 it is necessary that at the modulation frequency, the power fluctuations of the laser light used must be shot noise limited in the amount of light detected at the interferometer output (typically up to a few Watts). Thus the excess power noise introduced by the amplification process may be reduced to an appropriate level. The noise properties of saturated free space Nd:YAG optical amplifiers remain to be experimentally evaluated. As mentioned earlier, a light source with the potential to combine the increased efficiency of solid state lasers with the advantage of using shorter wavelength light is a frequency doubled Nd:YAG laser. While single frequency powers in excess of 10 W are obtainable, sources of frequency-controllable doubled light of an acceptable power level have still to be proven in terms of long term reliability, but are likely to become available in the future. Prototype detectors using laser interferometry have been constructed by various research groups around the world — at the Max-Planck-Institut für Quantenoptik in Garching , at the University of Glasgow , at California Institute of Technology , at the Massachusets Institute of Technology , at the Institute of Space and Astronautical Science in Tokyo  and at the astronomical observatory in Tokyo . These detectors have arm lengths varying from 10 m to 100 m and have or had either multibeam delay lines or resonant Fabry-Perot cavities in their arms. The 10 m detector at Glasgow is shown in Fig. 8. The 10 m prototype gravitational wave detector at Glasgow. Several years ago the sensitivities of some of these detectors reached a level — better than 10-18 for millisecond pulses — such that the technology could be considered sufficiently mature to propose the construction of detectors of much longer baseline which should be capable of reaching the performance required to have a real possibility of detecting gravitational waves. Thus an international network of gravitational wave detectors is now under construction. 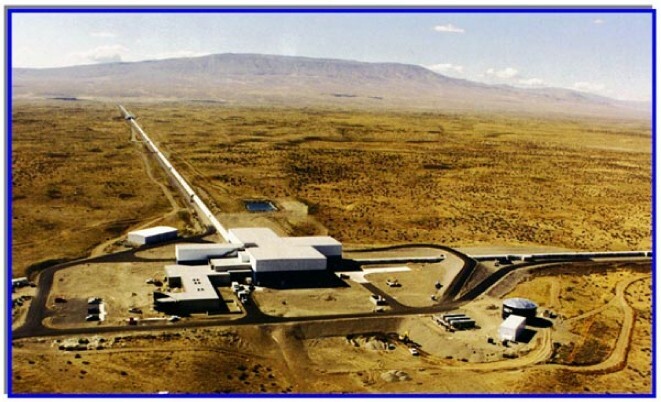 The American LIGO project comprises the building of two detector systems with arms of 4 km length, one in Hanford, Washington State, and one in Livingston, Louisiana. One half length, 2 km, interferometer is also being built inside the same evacuated enclosure at Hanford. Construction at both sites is proceeding well and should allow prelimimary coincident operation to be carried out in 2001. A birds-eye view of the Hanford site showing the central building and the directions of the two arms is shown in Fig. 9. A bird’s eye view of the LIGO detector, sited in Hanford, Washington State. The French/Italian VIRGO detector of 3 km arm length at Cascina near Pisa is also well into construction with the interferometry in the central part being ready for testing in 2000 and final operation expected for late 2002. As mentioned earlier it is designed to have better performance, down to 10 Hz than the other detectors as shown in Fig. 10, where the level of contributing noise sources and some possible signal levels are shown. 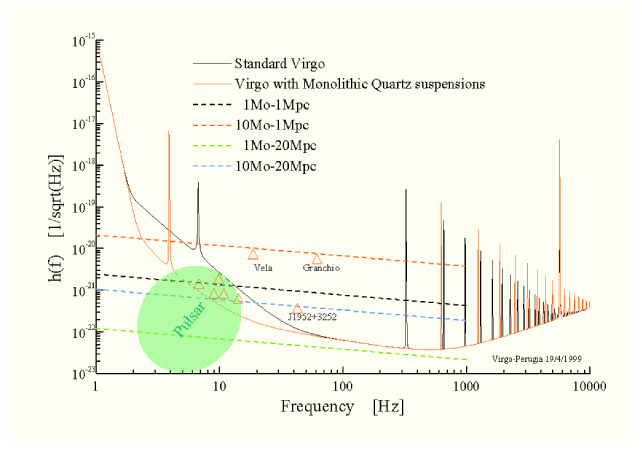 Sensitivity curves for VIRGO showing the total contribution of the important noise sources. The signal levels expected from a number of pulsars after six months of integration are shown as are signal levels from some compact binary systems of different mass and at different distances. The TAMA 300 detector, which has arms of length 300 m, is at a relatively advanced stage of construction at the Tokyo Astronomical Observatory. 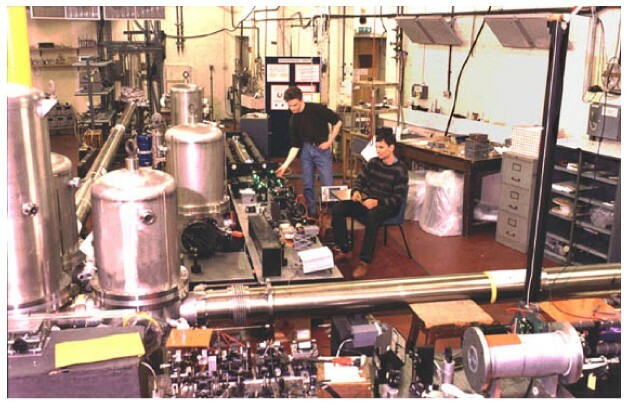 This detector is being built mainly underground; initial operation of the interferometer has been achieved in 1999 and power recycling is now being implemented. 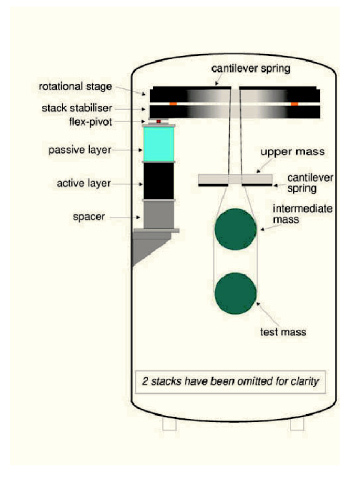 All the systems mentioned above are designed to use resonant cavities in the arms of the detectors and use standard wire sling techniques for suspending the test masses. The German/British detector, GEO 600, is somewhat different. It makes use of a four pass delay line system with advanced optical signal enhancement techniques, utilises very low loss fused silica suspensions for the test masses, and should have a sensitivity at frequencies above a few hundred Hz comparable to the first phases of VIRGO and LIGO when they are in initial operation. Construction is advancing well and initial operation of the GEO 600 detector is expected to commence in 2001. During the following years we can expect some very interesting coincidence searches for gravitational waves, at a sensitivity level of approximately 10-21 for pulses of several milliseconds duration. This level of sensitivity is expected to be improved on when the longer LIGO and VIRGO detectors are upgraded. Indeed plans for an upgraded LIGO, LIGO 2, are already on the drawing board. Plans are to use 30 kg sapphire test masses for this detector, suspended by fused silica fibers or ribbons, along with an improved seismic isolation system, increased laser power, of the order of 100 W, and signal recycling . The contribution of the different noise source to the expected interferometer sensitivity as contained in , is shown in Fig. 11. Noise contributions to the expected sensitivity of the LIGO 2 interferometer. It should be noted that very recent work by Braginsky and colleagues in Moscow  is suggesting that a form of mechanical loss known as thermoelastic damping  is important in bulk crystalline materials such as as sapphire, and may be represented by a noise line somewhat higher than the thermal noise in the above figure. This is currently under investigation (at the beginning of 2000). 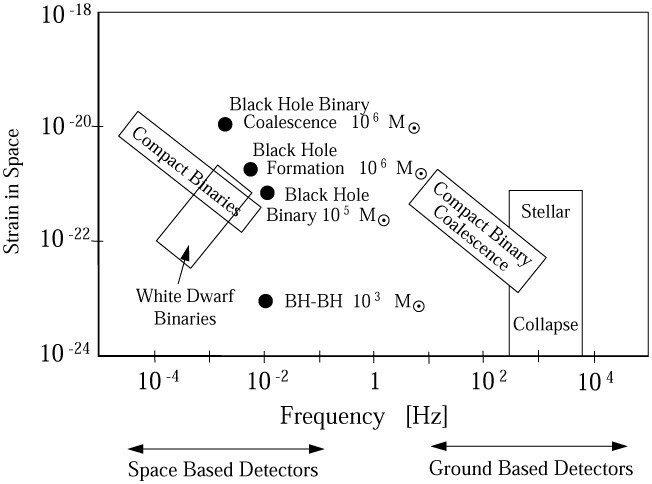 Perhaps the most interesting gravitational wave signals — those resulting from the formation and coalescence of black holes in the range 103 to 106 solar masses — will lie in the region of 10-4 Hz to 10-1 Hz, and a detector whose strain sensitivity is approximately 10-23 over relevant timescales is required to search for these. The most promising way of looking for such signals is to fly a laser interferometer in space, i.e. to launch a number of drag free space craft into orbit and to compare the distances between test masses in these craft using laser interferometry. LISA — Laser Interferometer Space Antenna (see for example [51, 52, 28]) — is being proposed by an American/European team; it consists of an array of three drag free spacecraft at the vertices of an equilateral triangle of length of side 5 × 106 km. This cluster is placed in an Earth-like orbit at a distance of 1 AU from the Sun, and 20 degrees behind the Earth. Proof masses inside the spacecraft (two in each spacecraft) form the end points of three separate but not independent interferometers. Each single two-arm Michelson type interferometer is formed from a vertex (actually consisting of the proof masses in a ‘central’ spacecraft), and the masses in two remote spacecraft as indicated in Fig. 12. The three-interferometer configuration provides redundancy against component failure, gives better detection probability, and allows the determination of polarisation of the incoming radiation. The spacecraft in which they are accommodated shields each pair of proof masses from external disturbances (e.g. solar radiation pressure). Drag free control servos enable the spacecraft to follow the proof masses to a high level of precision, the drag compensation being effected using proportional electric thrusters. Illumination of the interferometers is by highly stabilised laser light from Nd:YAG lasers at a wavelength of 1.064 microns, laser powers of ≃ 1 W being available from monolithic, non planar ring oscillators which are diode pumped. 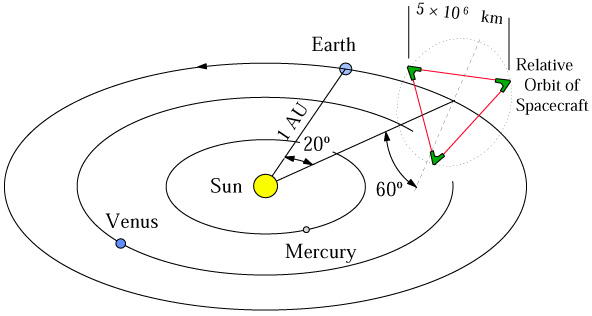 For each interferometer — consisting of a central spacecraft and two distant spacecraft — two lasers in the central spacecraft, each pointing along one of the arms, are phase locked together so they effectively behave as a single laser. For LISA to achieve its design performance, adjacent arm lengths have to be sensed to an accuracy of better than 30 pm(Hz)-1/2. Because of the long distances involved and the spatial extent of the laser beams (the diffraction limited laser spot size, after travelling 5 × 106 km, is approximately 50 km in diameter), the low photon fluxes make it impossible to use standard mirrors for reflection; thus active mirrors with phase locked laser transponders on the spacecraft will be implemented. Telescope mirrors will be used to reduce diffraction losses on transmission of the beam and to increase the collecting area for reception of the beam. Given that the available laser power in each arm is of the order of 1 W, and that arguments similar to those already discussed for ground based detectors can be made, photoelectron shot noise considerations suggest that the diameters of the transmitting and receiving mirrors on the space craft need to be ≃ 30 cm. and thus if the spectral density δϕ is measured, the spectral density δv can be estimated. This estimate can then be used to correct the signal obtained by subtracting the phase difference measurements in two adjacent arms, allowing the search for gravitational waves to be carried out. This correction is made easier if each arm length is known to a few km and the difference in arm length is known to a few tens of metres. These quantities should be available from radar and optical ranging measurements. If however they are not well enough known then they can be found by searching through a range of possible values to minimise the effect of frequency noise on the ‘gravitational wave’ signal. There are many other issues associated with the laser interferometry for LISA which are not dealt with here and the interested reader should refer to  for a discussion of some of these. LISA has been adopted by ESA as a Cornerstone project in their post Horizon 2000 programme and the possibility of it being a joint ESA/NASA collaborative mission is being enthusiastically addressed at present. A large amount of effort worldwide is now being invested in the development of both ground and spaced based searches for gravitational radiation and we are entering a new era where the signals from neutron star and black hole interactions will widen our understanding of the Universe. Beyond this, however, there is the very exciting prospect that gravitational wave astronomy will, like radio astronomy and X-ray astronomy, allow the discovery of very active sources currently unknown to us. We would like to thank our colleagues in the GEO 600 project and at Stanford University for useful discussions. We are grateful to the LSC and the VIRGO group for the use of some of their figures. We are indebted to PPARC (UK), NSF (USA), the University of Glasgow and Stanford University for support. For the update the author list has changed to be Matthew Pitkin, Stuart Reid, Sheila Rowan and Jim Hough. There have been minor updates to Sections 1, 2 and 3; major updates to Sections 4 and 5; Section 6 has been renamed and includes entirely new material on the operation of, and results from, the first generation of gravitational wave detectors and upgrades that are under way; and Section 7 also includes major updates about the status of LISA. The number of references has increased from 110 to 324.